Tropical florals and foliage. 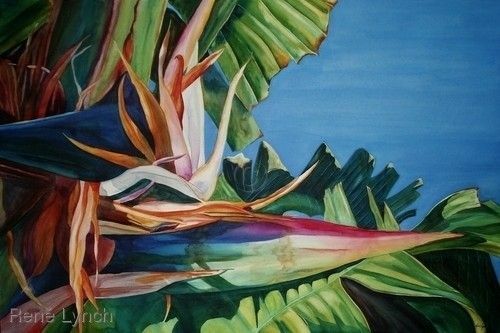 These paintings were inspired the time I spent living on the North Shore of Kauai, as well as my life in the tropics of Florida and the Carribean. "Color, rhythm and value; these are the driving forces behind my work. I see lushness all around me, and I want to capture it, process it and throw it back out onto the surface. I see colors so ripe that I can almost taste them, and I want to convey that sensation to those who view my work. Using water based media that mimics the organic qualities of my subject matter, I try to recreate the exuberance of our natural world"